Ryan Jefforey Mathews (born October 10, 1987) is a former American football running back. He played college football at Fresno State. He was drafted by the San Diego Chargers in the first round, 12th overall, in the 2010 NFL Draft. He was selected to the Pro Bowl in 2011. After junior high school, he moved to Bakersfield to face tougher athletic competition. In December 2009, Mathews decided to forgo his senior season and enter the 2010 NFL Draft. His 1,808 yards rushing ranks him behind only LaDainian Tomlinson and George Jones in the WAC season record books. 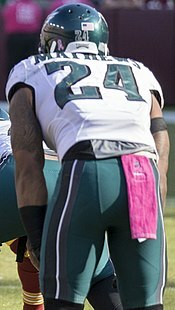 Mathews signed a three-year deal with the Philadelphia Eagles on March 12, 2015. However, the Eagles also signed NFL rushing champion DeMarco Murray and already had Darren Sproles, who scored six rushing touchdowns on limited carries in 2014. However, Murray played poorly in the first two games of the season, rushing for 11 yards on 21 carries, although Mathews was not much better, rushing for 4 yards on 4 carries and 1 touchdown, while Sproles led the team with 46 yards on 6 carries. When Murray went down with a hamstring injury in week 3, Mathews stepped up against the 2-0 New York Jets and rushed for 108 yards on 24 carries while catching a 23-yard receiving touchdown. When Murray returned in week 4, Mathews was again the backup, while Murray had another sub-par game. In Week 5, Murray rushed for 83 yards on 20 carries leading the team in rushing, but Mathews was only ten yards behind with only 8 carries, and he also had a touchdown. Mathew's best performance was against the then undefeated Carolina Panthers, where he rushed for 97 yards on 6 carries. Mathews' chances of starting were damaged when he was knocked out with a concussion in a 20-19 loss to the Miami Dolphins, which led to Darren Sproles becoming the feature back. Upon his return, he played on an average level, but had a good game against the 11-2 Arizona Cardinals (11 carries for 53 yards) and finally won the starting job. Ultimately, he lost his starting job to DeMarco Murray in a Week 16 loss to the Redskins, where he had 4 carries for 5 yards and a touchdown. Through an up and down season, Mathews finished by leading the team in rushing TDs with 6, as well as compiling 539 rushing yards on 106 carries, a 5.1 average. In 2016, Mathews played in 13 games with 8 starts, finishing the season with 661 rushing yards and eight touchdowns along with 13 receptions for 115 yards and one touchdown. He was placed on injured reserve on December 27, 2016 after suffering a herniated disc against the New York Giants in Week 16. On August 15, 2017, Mathews was released by the Eagles after recovering from offseason neck surgery. Mathews grew up as a fan of the San Diego Chargers since childhood and is a fan of LaDainian Tomlinson, particularly because of his running style. He wore No. 21 in high school and at Fresno State in honor of Tomlinson. ^ "Q&A: Ryan Mathews". November 4, 2010. Retrieved August 17, 2017. ^ "Countdown to kickoff: 4 days". GoBulldogs.com. August 28, 2008. Retrieved August 17, 2017. ^ Kevin Acee (April 24, 2010). "For Mathews and mother, a long, arduous journey". The San Diego Union-Tribune. Bakersfield.com. Retrieved August 17, 2017 – via archive.is. ^ "Ryan Mathews College Profile". Scout.com. Retrieved August 16, 2017. ^ a b "Draft Profile". CBSSports.com. Retrieved August 17, 2017. ^ a b "Ryan Mathews - Fresno State Official Athletic Site". GoBulldogs.com. Retrieved August 17, 2017. ^ "Mathews out vs. Louisiana Tech". ESPN.com. Associated Press. November 17, 2009. Retrieved August 17, 2017. ^ Graham Watson (December 7, 2009). "Boise State leads All-WAC team selections". ESPN. Retrieved August 17, 2017. ^ "2009 All-America Team". CBSSports.com. December 8, 2009. Archived from the original on October 16, 2012. Retrieved May 7, 2010. ^ "SI.com's 2009 All-Americans". Sports Illustrated. CNN. December 15, 2009. Archived from the original on January 8, 2010. ^ "2009 Associated Press All-America Team". CBSSports.com. December 15, 2009. Archived from the original on October 16, 2012. Retrieved December 16, 2009. ^ Joe Fortenbaugh (March 15, 2010). "Gerhart posts top RB Wonderlic score". National Football Post. Retrieved August 17, 2017. ^ "Chargers sign 12th overall pick RB Ryan Mathews". USA Today. August 1, 2010. Retrieved August 17, 2017. ^ Jim Alexander (October 8, 2011). "Chargers' Ryan Mathews settling in". The Press Enterprise. Archived from the original on November 25, 2011. ^ Bill Williamson (January 23, 2011). "Two Chargers added to Pro Bowl team". ESPN.com. ^ "San Diego Chargers' Ryan Mathews breaks collarbone, out 4-6 weeks". ESPN.com. August 10, 2012. Retrieved August 17, 2017. ^ "Matt Ryan shines as Falcons defense shuts down Chargers". ESPN.com. September 23, 2012. Retrieved August 17, 2017. ^ "Matt Ryan shines as Falcons defense shuts down Chargers". ESPN.com. Associated Press. September 23, 2012. Retrieved August 17, 2017. ^ "Atlanta Falcons vs. San Diego Chargers - Box Score - September 23, 2012 - ESPN". ESPN.com. September 23, 2012. Retrieved August 17, 2017. ^ Gehlken, Michael (October 1, 2012). "Chargers easing Ryan Mathews into action". U-T San Diego. Retrieved August 17, 2017. If Mathews had not fumbled against the Falcons, it is expected the Pro Bowler would have started against the Chiefs. ^ Dan Hanzus (December 18, 2012). "Chargers place Ryan Mathews, Malcom Floyd on IR". NFL.com. Retrieved August 17, 2017. ^ David White (January 11, 2014). "Ryan Mathews' body keeps cutting into building of his NFL body of work". Fresno Bee. Retrieved August 17, 2017. ^ Michael Gehlken (January 3, 2014). "Mathews thanks offensive line with Gucci". U-T San Diego. Retrieved August 17, 2017. ^ a b c Gehlken, Michael (December 30, 2013). "RB rushes for career-high 144 yards against Chiefs". U-T San Diego. Archived from the original on January 6, 2014. ^ a b Michael Gehlken (November 30, 2014). "Chargers run game looks to lead push". U-T San Diego. Archived from the original on December 8, 2014. ^ "Ryan Mathews". Chargers.com. Retrieved August 17, 2017. ^ Michael Gehlken (December 22, 2013). "Ryan Mathews injures ankle in win". U-T San Diego. Retrieved August 17, 2017. ^ Williams, Eric D. (January 10, 2014). "Ryan Mathews hoping to play". ESPN.com. Retrieved August 17, 2017. ^ Williams, Eric D. (January 12, 2014). "Ryan Mathews active vs. Broncos". ESPN.com. Archived from the original on January 12, 2014. ^ Kevin Acee (January 12, 2014). "Mathews finishes season on sideline". U-T San Diego. Retrieved August 17, 2017. ^ Greg Rosenthal (September 15, 2014). "Injury roundup: Ryan Mathews out 4-5 weeks". NFL.com. Retrieved September 15, 2014. ^ Michael Gehlken (December 7, 2014). "Offense sputters in loss to Pats". U-T San Diego. Archived from the original on December 28, 2014. ^ Krasovic, Tom (December 26, 2014). "Ryan Mathews: will return 'as fast as I can'". U-T San Diego. Retrieved August 17, 2017. ^ Alex Smith (December 27, 2016). "Ryan Mathews Officially Placed On IR". PhiladelphiaEagles.com. ^ Patra, Kevin (August 15, 2017). "Ryan Mathews released by Philadelphia Eagles". NFL.com.